When the Red Bull and McLaren F1 drivers banged heads at the Turkish Grand Prix this weekend Brits on Pole reporter-at-large Scott McCarthy was in the stands at Istanbul Park to watch the fireworks in person. But the F1 race wasn’t the only event on the programme. Scott also popped behind the scenes to the GP2 paddock to catch up with British racer Sam Bird, to hear about his season so far and his plans for building on the progress he’s made. This weekend I was in Istanbul for the Turkish Grand Prix and on Friday, after slowly baking in the heat of the Turn 1 grandstand for the practice sessions, I was fortunate enough to be invited into the GP2 paddock area courtesy of ART Grand Prix driver Sam Bird. Sam is in his rookie season in the GP2 series and has already impressed in his first two races in Barcelona and Monaco. As I’m primarily here as a paying customer, it’s given me a unique chance to see both sides of the Grand Prix divide. However, I soon discovered that, even beyond the paddock entrance that my shiny guest pass let me into, there is still very much a class divide between GP2 and F1. 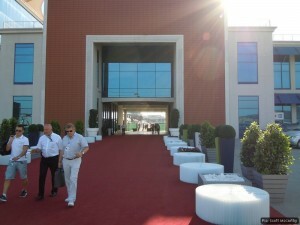 Even with my elevated access privileges I wasn’t allowed beyond the lavish red carpet leading to the F1 paddock. Instead I wandered past the helipads towards the more modest yet still very pleasant GP2 paddock. And it was very busy. 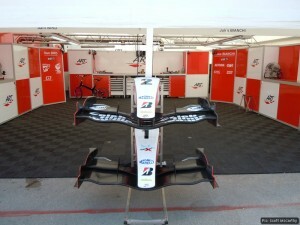 GP3 cars were being wheeled back as their practice session had just finished. When the GP2 and GP3 teams have a session on track they need to pack up their gear and set up shop in the pit lane in front of the F1 teams who get permanent pit facilities at each race. ART generally get to set up in front of Ferrari’s garage due to the link between former team principal Jean Todt and his son Nicolas, one of the main shareholders in ART. As I walked through the paddock I saw a truck stuffed full of Pirelli tyres unloading a batch for the GP3 teams and glimpsed the GP2 post-qualifying press conference taking place in a tiny room attached to the side of a truck. Somewhere in the middle of all this was the ART garage – unfortunately devoid of cars at the time I was there as they were with the scrutineers after qualifying. 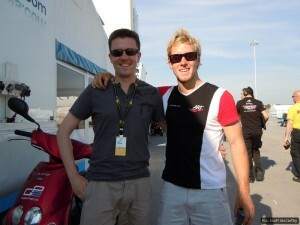 However, one very important part of the race package was present, namely Sam Bird himself. We wandered over to the GP2 hospitality area where I accepted a complimentary can of Coke that I’d been paying £5 for out in the real world all day. I then had a chance to chat to Sam about all things motorsports. A first-lap shunt and a problem pit-stop in his first two events saw him charging from the back of the field and making some impressive overtaking moves, setting fastest laps in the process. He was keen to thank the team for giving him the equipment to do this and hopes to convert the overtaking skills evident in the first two races into wins as the season progresses. Like many of the current GP2 drivers, Sam’s ultimate aim is to impress sufficiently to gain himself an F1 contract. With this in mind he hopes that his achievements in GP2 so far this season will cause some F1 scouts to take note. 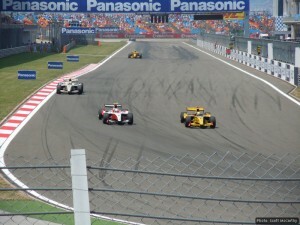 Performance in GP2 is about more than the black-and-white of race finishing positions. It includes plenty of other factors, not least strength of team and team-mate. Sam’s Barcelona performance in particular, on a track known for its lack of overtaking opportunities, saw him claw his way back from dead last to ninth. “I hope they [F1 managers] are watching and get the full picture as to why I’m been at the back for the first few races, and how I’ve fought back,” he said. I asked Sam about any significant races or moments that he felt really helped his career and to allow him to progress. He mentioned signing for ART in particular, and also singles out Macau, where he grabbed a podium in last year’s all-star Formula 3 race. Sam’s already had a taste of F1 courtesy of the occasional test session with AT&T Williams, which he told me he had enjoyed immensely, and was extremely grateful to have been given the opportunity. From talking to Sam it’s clear that he’s a true motorsport nut and considers himself as much of a fan as he is a driver. Be it rallycross racing in Pembrey, or F1 at Spa, he loves watching great racing in any discipline. Something he tells me he gets from his parents who too can’t get enough of any kind of motorsport. I asked Sam which circuits he’s looking forward to driving this year as he follows the F1 cars around Europe. He immediately mentioned Spa and Monza, and in particular Silverstone, as for him it’s the first time he will have raced at his home grand prix. My overall impression of Sam is of a very confident yet level-headed young man. He knows he is a talented driver but also knows that talent isn’t an accident. He’s a firm believer in good preparation, be that physically, mentally or studying all available data about an upcoming track. Having watched a few GP2 races this season, and spoken to him in person, I’m convinced that he has the ability to convert his early-season speed into race wins. In fact, I hope that in the not-too-distant future we might be talking about another British driver in the same sentence as Button and Hamilton. If he succeeds, maybe next time I WILL get to walk down the lavish red carpet and meet him in the F1 paddock. 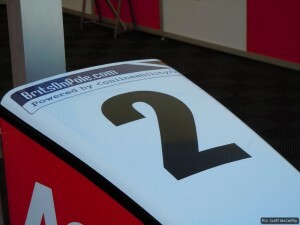 To see Scott’s full GP2 photo gallery, visit his website here. Author: Scott McCarthy. Brits on Pole reporter-at-large and guest writer. Scott has written 9 articles for us. Categorised under F1, GP2, GP3, tagged under Istanbul Park, Sam Bird, Turkish Grand Prix. So who’s confirmed for this season so far?